Need a competent roofer to repair your roof in Katy? If you notice roofing problems such as worn, torn or missing shingles, a new roof isn't necessarily the best answer. Often, you just need to have your roof repaired. Call the roof repair team at LYF Construction. We've been repairing roofs in Katy Texas for over 16 years and we can help you too. Simply call (832) 304-6764 for a free quote. The roof repair team at LYF Construction is fully staffed and well-trained to handle just about any type of roof repair in Katy. Striving for nothing less than your complete satisfaction, our roof repair pros take pride getting your repair right the first time. What's worse than thinking the problem is solved, only to spring a leak during the next big storm? Call (832) 304-6764 for quality roofing repair services that will last. Timing is crucial when roof repairs are needed. Your roof should be repaired before the problem becomes worse and lasting damage ensues. Influx of water and moisture from a leaking Katy roof can promote growth of mold and mildew, which can lead to eventual structural problems and health issues from compromised air quality if not resolved. When you have a roof leak and require repair, call (832) 304-6764 for a quick response. When you call LYF Construction to repair your roof in Katy, you'll be pleased with the quick response you'll receive. 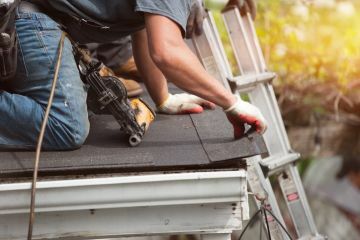 We will schedule a convenient time to visited and provide you with a full report including a customized roof repair plan and a written estimate of the cost, so that you can make an educated decision about your plan of action. Should you choose LYF Construction to complete your Katy roofing repairs, we'll schedule a time to come back by and complete the job. Once the repairs are finished, we'll be sure to walk the premises and pick up all debris, leaving your home as good as new.